A new observatory still under construction has given astronomers a major breakthrough in understanding a nearby planetary system that can provide valuable clues about how such systems form and evolve. The scientists used the Atacama Large Millimeter/submillimeter Array (ALMA) to discover that planets orbiting the star Fomalhaut must be much smaller than originally thought. Hubble Space Telescope image in blue. The discovery, which helped resolve a controversy among earlier observers of the system, was made possible by high-resolution images of a disk, or ring, of dust orbiting the star, about 25 light-years from Earth. The ALMA images show that both the inner and outer edges of the thin, dusty disk have very sharp edges. That fact, combined with computer simulations, led the scientists to conclude that the dust particles in the disk are kept within the disk by the gravitational effect of two planets -- one closer to the star than the disk and one more distant. Their calculations also indicated the probable size of the planets -- larger than Mars but no larger than a few times the size of the Earth. This is much smaller than astronomers had previously thought. In 2008, a Hubble Space Telescope (HST) image had revealed the inner planet, then thought to be larger than Saturn, the second-largest planet in our Solar System. However, later observations with infrared telescopes failed to detect the planet. That failure led some astronomers to doubt the existence of the planet in the HST image. Also, the HST visible-light image detected very small dust grains that are pushed outward by the star's radiation, thus blurring the structure of the dusty disk. The ALMA observations, at wavelengths longer than those of visible light, traced larger dust grains -- about 1 millimeter in diameter -- that are not moved by the star's radiation. This clearly revealed the disk's sharp edges, which indicate the gravitational effect of the two planets. "Combining ALMA observations of the ring's shape with computer models, we can place very tight limits on the mass and orbit of any planet near the ring," said Aaron Boley, a Sagan Fellow at the University of Florida, leader of the study. "The masses of these planets must be small; otherwise the planets would destroy the ring," he added. The small sizes of the planets explain why the earlier infrared observations failed to detect them, the scientists said. The ALMA research shows that the ring's width is about 16 times the distance from the Sun to the Earth, and is only one-seventh as thick as it is wide. "The ring is even more narrow and thinner than previously thought," said Matthew Payne, also of the University of Florida. The ring is about 140 times the Sun-Earth distance from the star. In our own Solar System, Pluto is about 40 times more distant from the Sun than the Earth. "Because of the small size of the planets near this ring and their large distance from their host star, they are among the coldest planets yet found orbiting a normal star," Boley said. 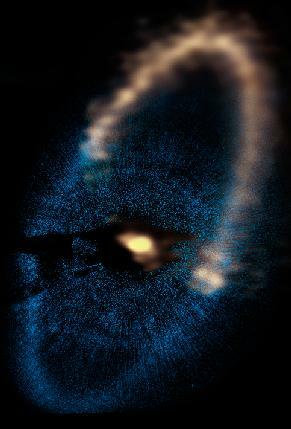 The scientists observed the Fomalhaut system in September and October of 2011, when only about a quarter of ALMA's planned 66 antennas were available. When construction is completed next year, the full system will be much more capable. ALMA's new capabilities, however, revealed the telltale structure that had eluded earlier millimeter-wave observers. "ALMA may still be under construction, but it already has proven to be the world's most powerful telescope for observing the Universe at millimeter and submillimeter wavelengths," said Stuartt Corder, of the National Radio Astronomy Observatory, a member of the observing team. The scientists will report their findings in an upcoming edition of the Astrophysical Journal Letters. The effect of planets or moons in keeping a dust ring's edges sharp was first seen when the Voyager 1 spacecraft flew by Saturn in 1980 and made detailed images of that planet's ring system. One ring of the planet Uranus is confined sharply by the moons Cordelia and Ophelia, in exactly the manner the ALMA observers propose for the ring around Fomalhaut. The moons confining those planets' rings are dubbed "shepherding moons." The moons or planets confining such dust rings do so through gravitational effects. A planet on the inside of the ring is orbiting the star more rapidly than the dust particles in the ring. Its gravity adds energy to the particles, pushing them outward. A planet on the ring's outside is moving more slowly than the dust particles, and its gravity decreases the energy of the particles, making them fall slightly inward. The Atacama Large Millimeter/submillimeter Array (ALMA), an international astronomy facility, is a partnership of Europe, North America and East Asia in cooperation with the Republic of Chile. ALMA is funded in Europe by the European Organization for Astronomical Research in the Southern Hemisphere (ESO), in North America by the U.S. National Science Foundation (NSF) in cooperation with the National Research Council of Canada (NRC) and the National Science Council of Taiwan (NSC) and in East Asia by the National Institutes of Natural Sciences (NINS) of Japan in cooperation with the Academia Sinica (AS) in Taiwan. ALMA construction and operations are led on behalf of Europe by ESO, on behalf of North America by the National Radio Astronomy Observatory (NRAO), which is managed by Associated Universities, Inc. (AUI) and on behalf of East Asia by the National Astronomical Observatory of Japan (NAOJ). The Joint ALMA Observatory (JAO) provides the unified leadership and management of the construction, commissioning and operation of ALMA.